I count myself fortunate to be headed to the FGS Conference in San Antonio this week. 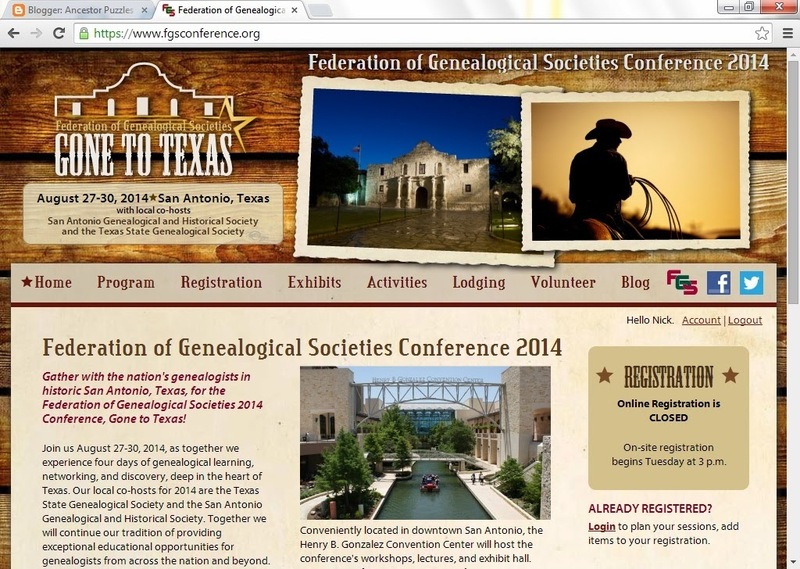 FGS is the Federation of Genealogical Societies, one of two highly regarded national genealogical organizations. My home society, the Bay Area Genealogical Society is sending a large contingent as are most of the societies in Texas. This year’s conference sessions will include a wide array of offerings from leading family history experts. Each day of the conference features a track, like"Ethnic Origins," focusing on different ethnic groups, including German, Polish, English, Hispanic, Eastern European, Irish, Scots-Irish, Scottish, Native American, and African American. If you have Texas ancestors, you don’t want to miss the "Texas and Neighboring States" research track. My selections will focus on German and African American sessions. Another session that sounds promising will be presented by Joshua Taylor who has starred on the Genealogy Roadshow on PBS: Embracing Technology: Tools You Can Use Today to Move Your Society Into Virtual Space. This will be one of several sessions geared toward improving operations of local societies. D. Joshua Taylor, MA, MLS, is the current president of the Federation of Genealogical Societies and a frequent speaker at national and regional family history events. He is the data strategy manager - US and Canada for Findmypast.com. He has appeared on Genealogy Roadshow (PBS) and Who Do You Think You Are? (NBC and TLC). We also like to call him the “Boy Wonder” due to his youth when compared to the rest of us grey-haired genealogists. On Thursday I am looking forward to hearing from Elizabeth Shown Mills on Poor? Black? Female? Southern Research Strategies. She will be using real characters from two historical novels – Tademy’s Cane River and Mills’s Isle of Canes to teach us to identify and track elusive women. Elizabeth Shown Mills, CG, CGL, FASG, is one of the most recognized genealogists and speakers in the field of family history research. She is known for her development of problem-solving methodology and her packed lectures at national conferences. She is past president of both the Board for Certification of Genealogists and the American Society of Genealogists. She was editor of the National Genealogical Society Quarterly for 16 years. Mills founded Samford University IGHR’s groundbreaking Advance Research Methodology track, taught for twelve years at the National Archives-based NIGR, and has been featured as a genealogical authority on CNN, NPR, PBS, and ABC-Australia, and BBVC’s 20th and 30th anniversary specials on Alex Haley’s Roots. She Is a prolific author and is recognized as one of the most authoritative experts in the field of genealogy. These are just two examples of the numerous experts that will be on hand in San Antonio this week. I will offer my perspectives in a recap of the conference next week.